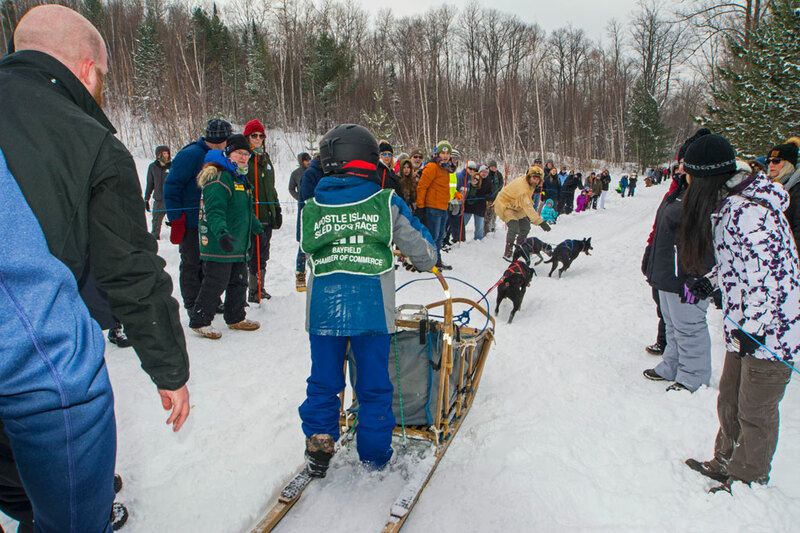 This past weekend was the 24th running of the Apostle Islands Sled Dog Race. It is a two day even with the first half of the race run on Saturday and the second half on Sunday. Attendance has become an almost annual event on our winter schedule. We meet friends at the race and then head out for a long lunch in Bayfield. 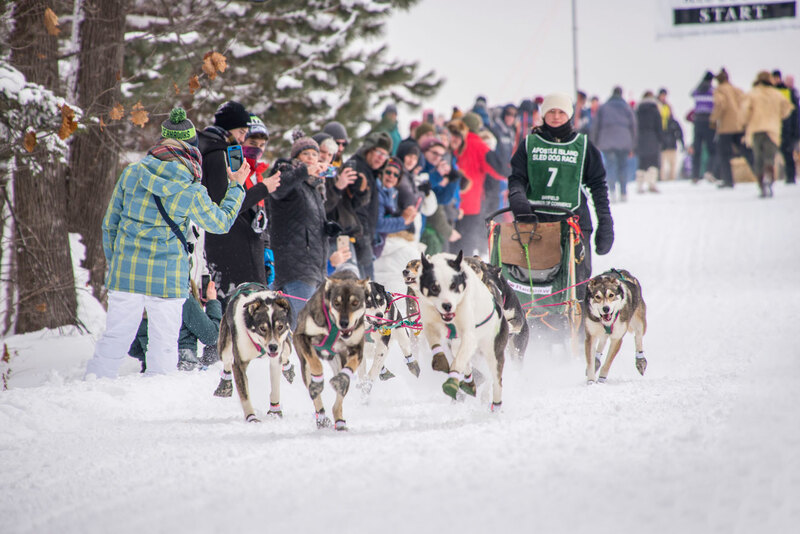 This years race occurred after some bitterly cold weather and it appeared that everyone had gotten cabin fever. 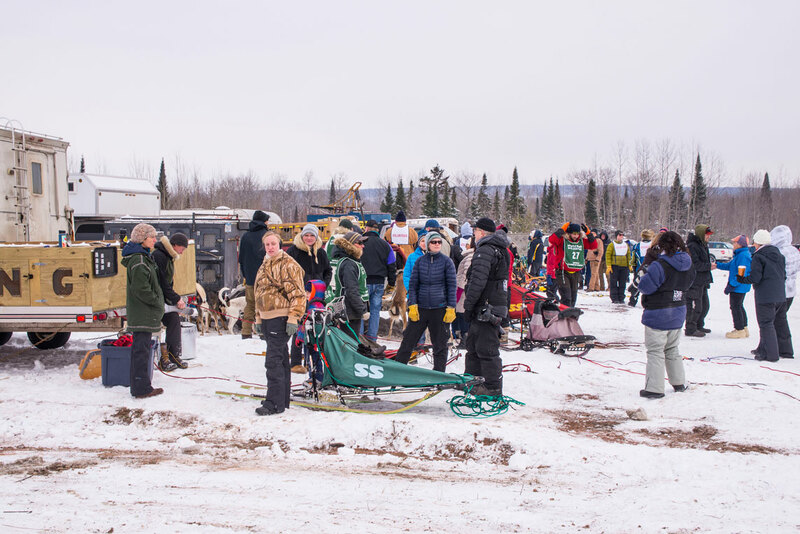 Saturday was the first warm day and the crowd at the race was much larger than recent years. The parking lot was almost full when we arrived a half hour before the start of the race. 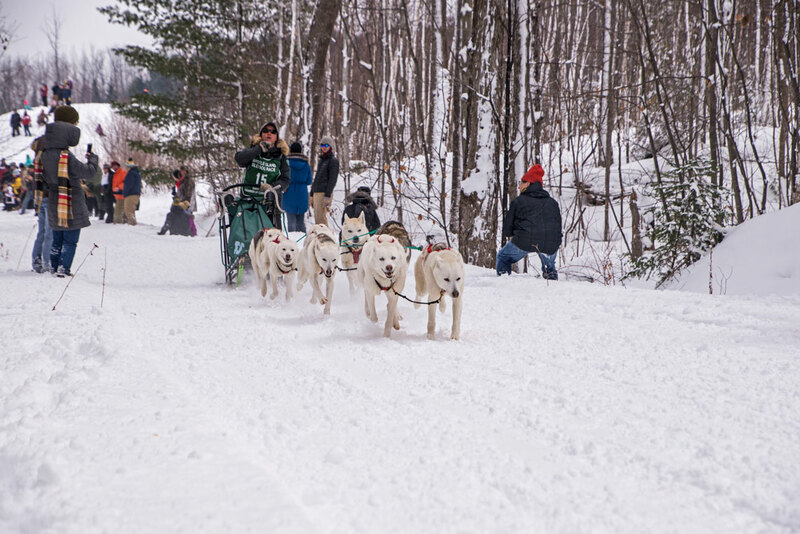 We like to arrive early so we can wander around and look at the dog teams and equipment before the start of the race. 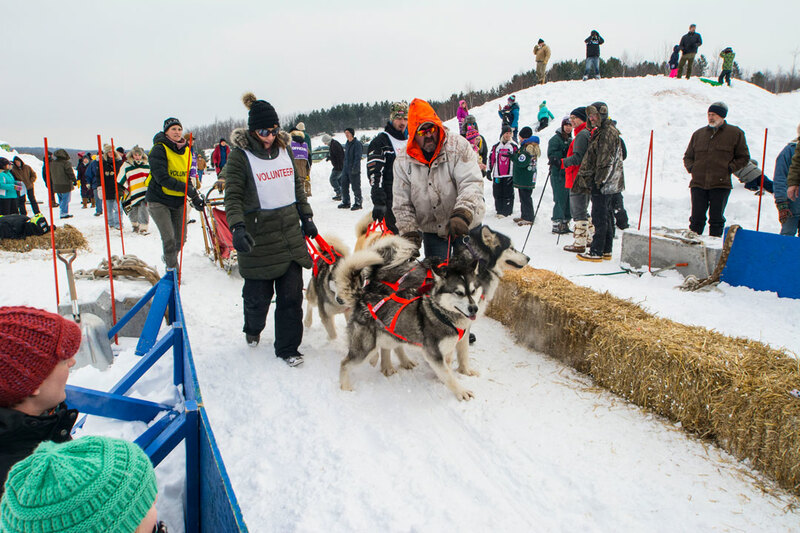 A Duluth TV crew was on hand to interview the racers. We were able to watch the interview on the evening news. 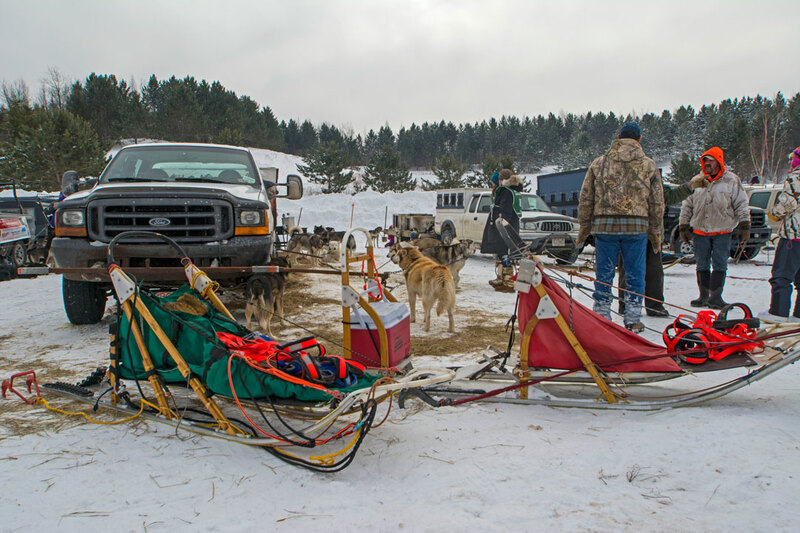 Shortly after we arrived the mushers started hooking up the dogs preparing for the start of the race. 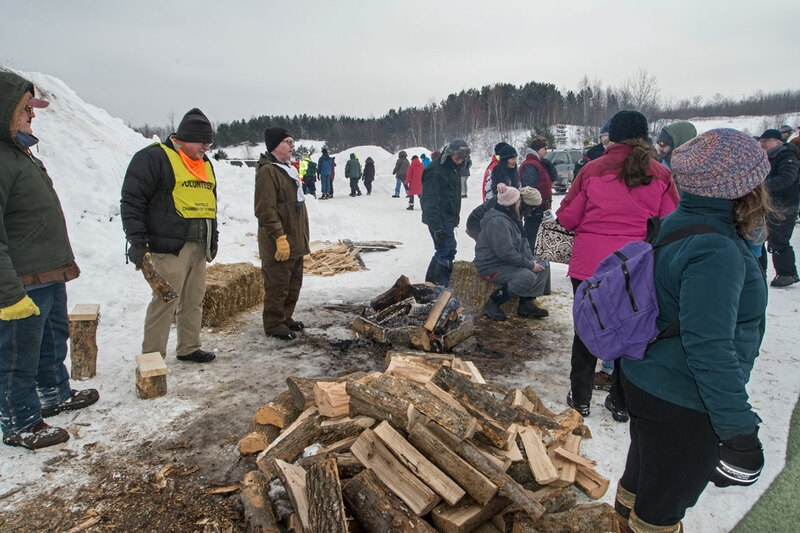 No race can take place without a large number of volunteers. They are what makes the race go. 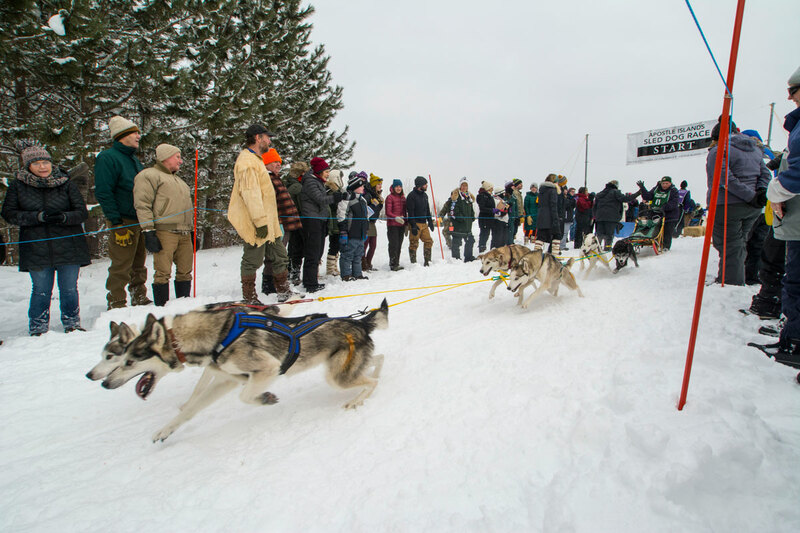 Some of the larger dog teams take five or six volunteers to them to the starting line. Some folks take the occasion to add a little color to the event. While most folks were taking photos and videos with their phone there were a few serious photographers in the crowd. At the start of the race I walked down the trail a ways to get away from the large crowd near the start line. After photographing for a while disaster struck and the mirror locked up on my camera. I had to walk back to the car and get another camera so I took a few more photos from the parking lot. 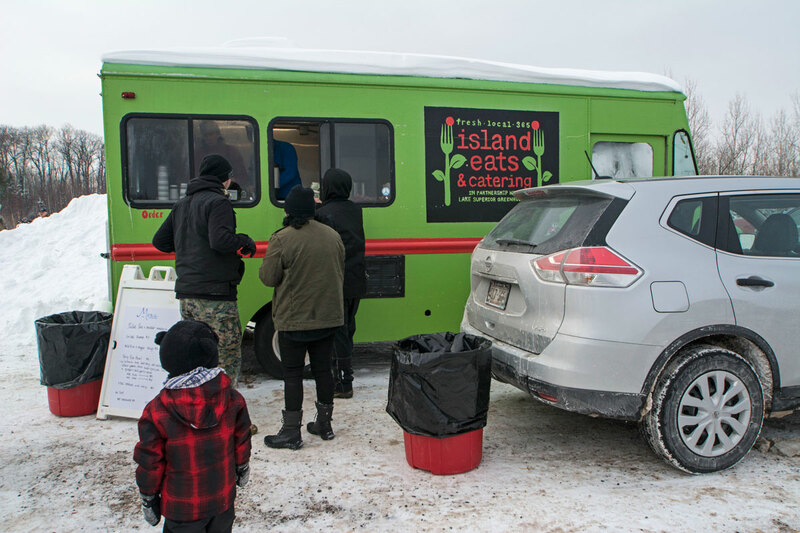 There was a food truck near the start of the race. There was a booth staffed by an Apostle Islands Ranger so I stopped by to ask about access to the ice caves. He indicated that the ice was good out on the lake but not so good around the ice caves. Maybe they will open and maybe they won’t. I then walked over to the starting line and photographed from there for the remainder of the race. 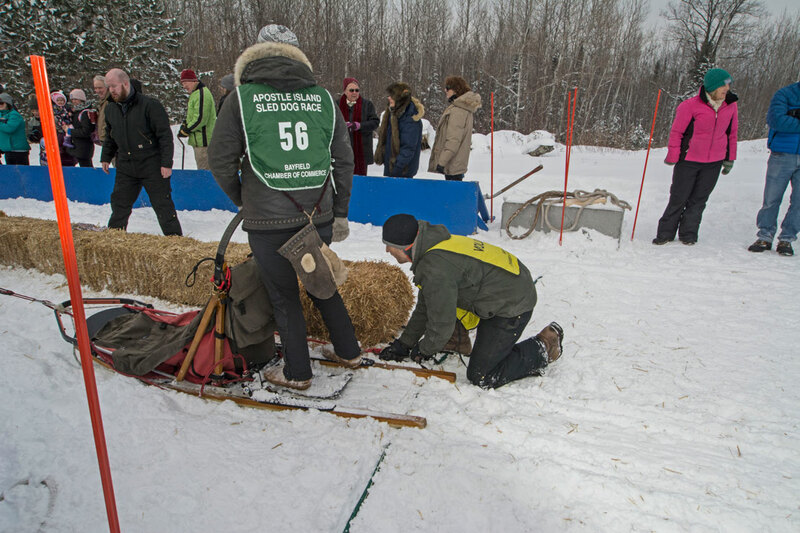 When a team comes up to the start line the musher hands off an anchor to one of the volunteers. The anchor is driven into the ground so the team can’t leave the start gate. 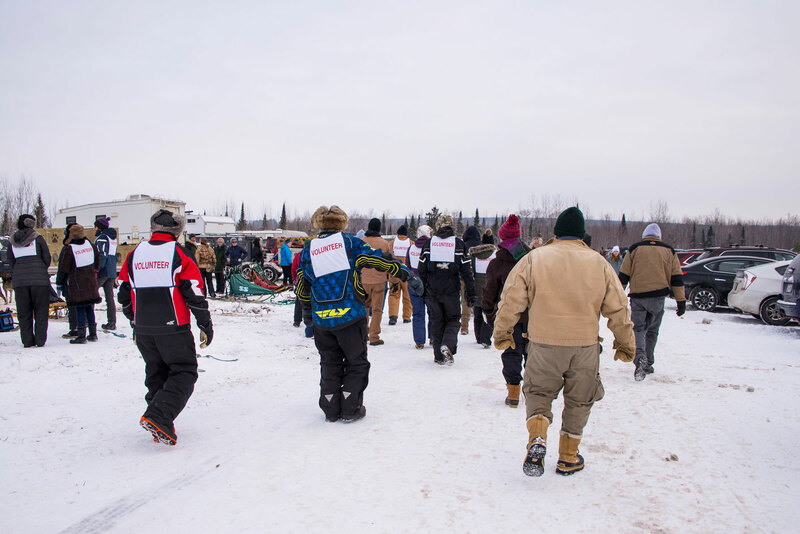 As the start time nears the anchor is handed back to the musher so the team can leave. While I was watching at the starting line my wife and our friends were about 50 yards down the course. Apparently there was a dog fight. The two lead dogs got into fight and headed into the crowd. One spectator was backed up against a tree. People immediately stepped in to separate the dogs but not before some blood was drawn. 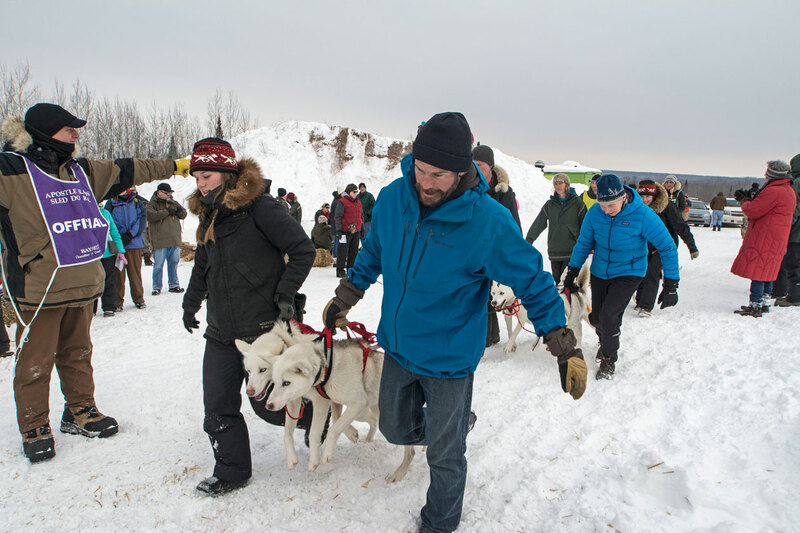 The musher ended up removing one of the dogs from the team. This is the first time we’ve seen anything like that at a race. There was a bonfire going but since it wasn’t all that cold out it wasn’t as crowded as it has been during some races. After all of the teams started the race we headed off to Bayfield for lunch. Generally after lunch we drive back and watch some of the teams finish the race but highway 13 wasn’t all that good so we drove over to Ashland and drove back on highway 2. 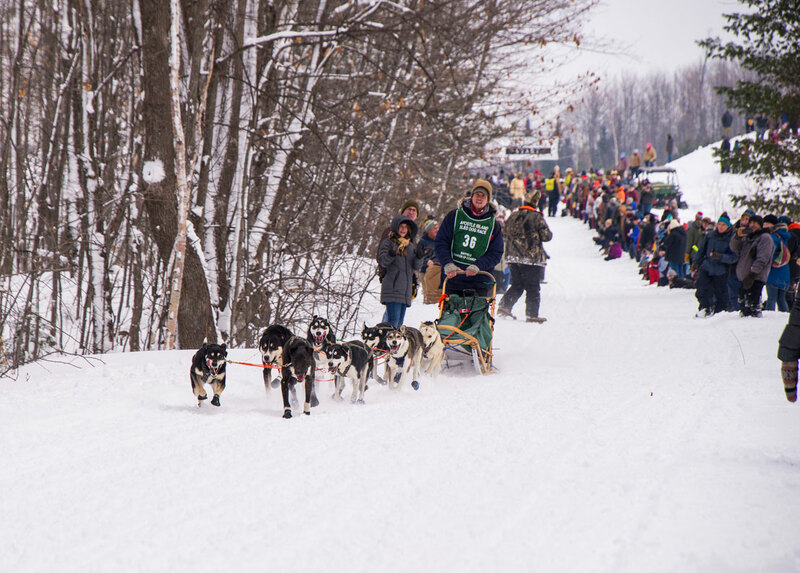 As we have for the last few years we drove up to Calumet at the end of February to do some cross country skiing and to watch the CopperDog Sled Dog Race. 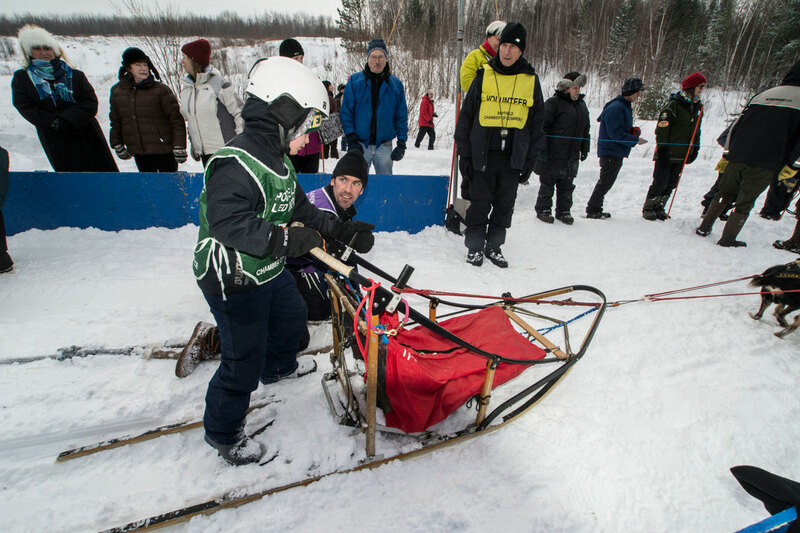 Last year we were out skiing and missed some of the preparations for the race. This year it was way too warm to ski so we walked over to the race well before it started. As you can see we were among the first to arrive. 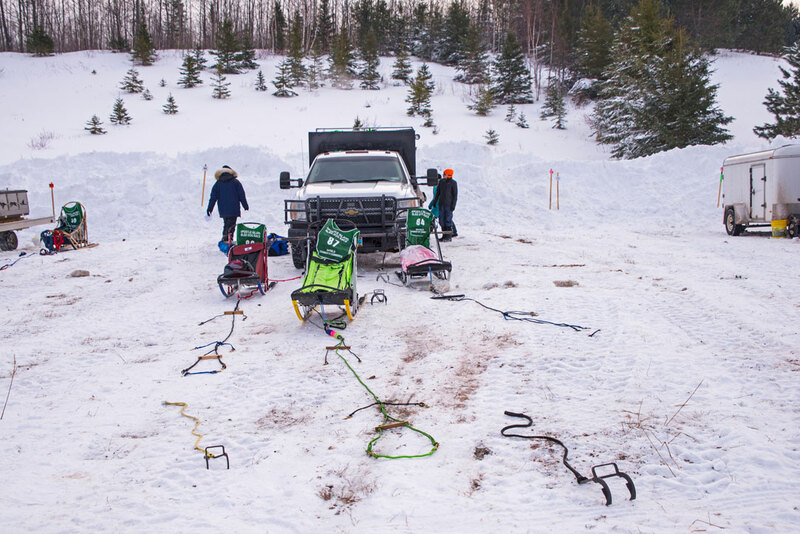 It was so warm that the street department was hauling in snow so the sleds could make it from the staging area to the to the starting line. The main intersection was about a foot deep in water and slush. 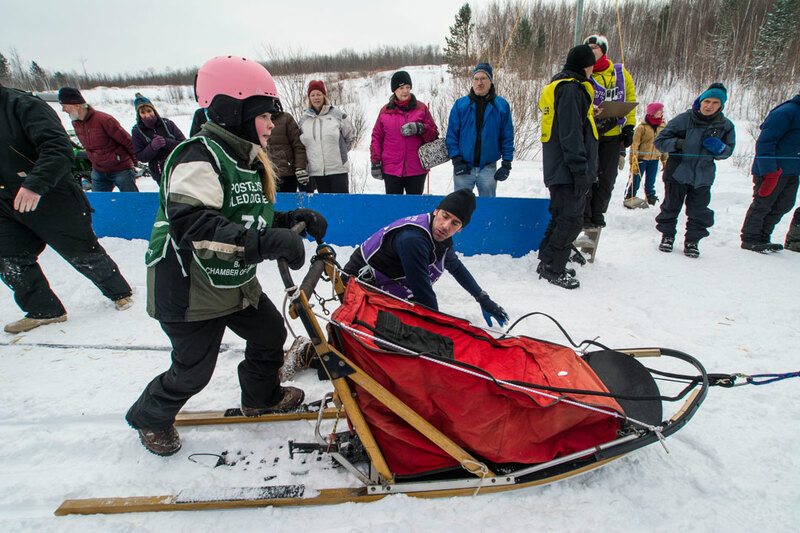 It remained a problem throughout the race as mushers and volunteers had trouble navigating through the deep slush. We walked around and watched the mushers feed the dogs. 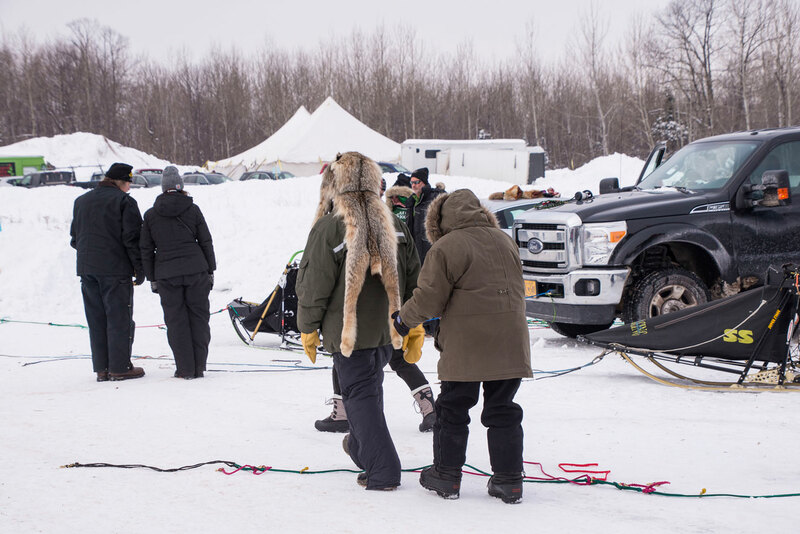 Typically they bring them out of the trucks and feed them and then they are put back into their house until they are hooked up to the sled. When they are brought out for feeding it’s a good time for the kids to walk around and pet the dogs. A number of the dogs were more interested in getting attention from the kids than they were in eating their pre race meal. There is a lot of gear that has to be organized before the race. 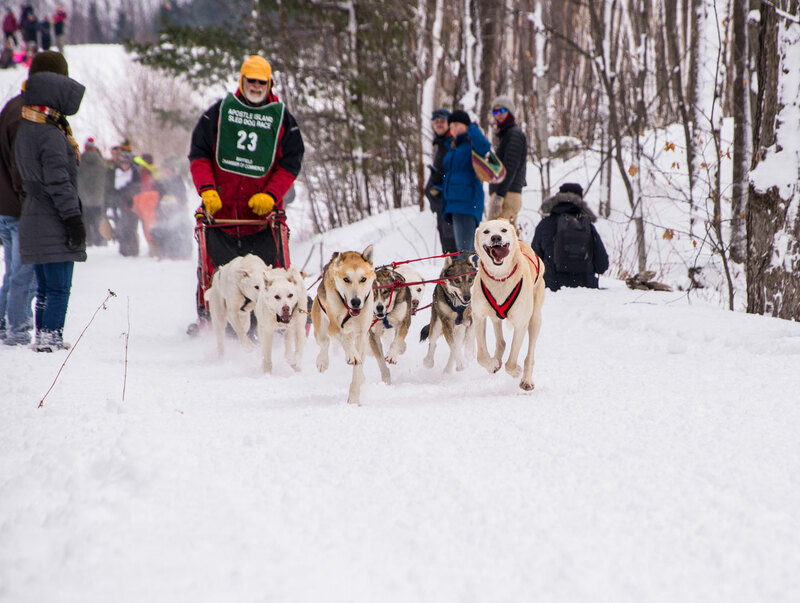 The start of the CopperDog takes place at night. 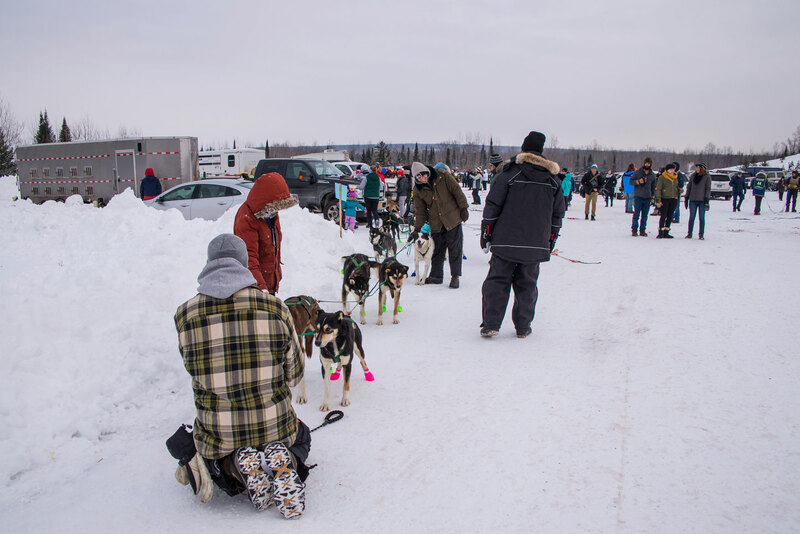 Once the dogs are at the starting line the musher walk through the team and talks to each of the dogs. 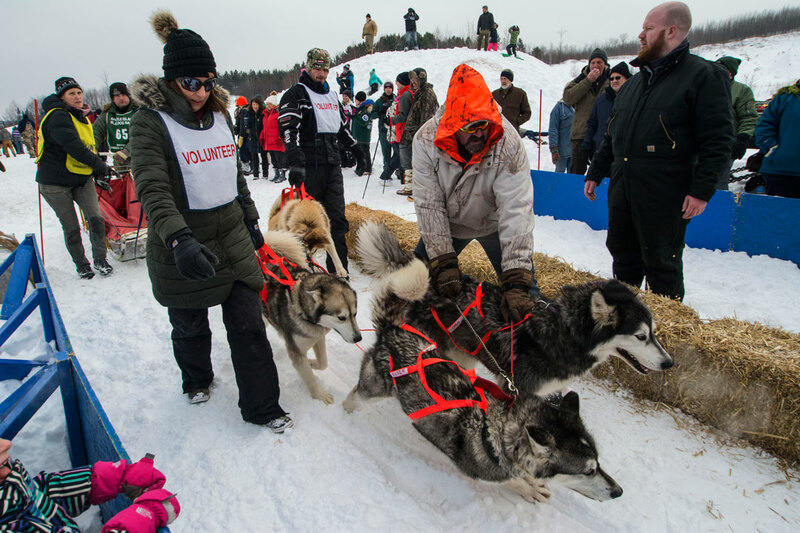 It takes a lot of volunteers to help get the teams from the staging area to the starting line and keep the dogs in line before they start. Some dogs are more excited than others. Some of the teams are very calm and others a wild with excitement. This spectator was getting a little tired toward the end of the evening. More photos from the race can be found on my website.